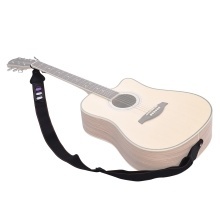 Soft and durable shoulder strap for acoustic/ electric guitars and bass. Microfiber + cotton material belt and high-quality synthetic leather ends. Adjustable length from 93-154cm, 5cm in width, fits for different persons. Designed with 3 small pockets for storing guitar picks, very user-friendly.